A couple of Thanksgivings ago, we learned what great things bacon butter can do to poultry and here we are doing it again on a smoked chicken with the addition of some chives. Cut along both sides of the backbone to remove it. Once the backbone is removed, press the chicken open so that it lays open like a book. Create a brine from 1 gallon of cold water and 1 cup of coarse kosher salt and mix together until the water returns to clear. Place the chicken into a lidded container or zip top bag and pour the brine over the chicken to cover. Refrigerate the chicken for 4-6 hours while it brines. While the chicken is brining, make the bacon butter mixture by adding 1 stick of butter, 3 TBS of chopped chives, 1 TBS of Jeff's original rub and 4 slices of uncooked, chopped bacon to a small mixing bowl. Mix the bacon butter ingredients together until it is well combined. When the chicken is finished brining, discard the brine and rinse the chicken under cold water. Set the chicken breast sides up on the cutting board and work the skin around the breast loose with your hands. Stuff the bacon butter mixture under the skin of the chicken. Brush olive oil onto the outside of the skin and season generously with Jeff's Texas style rub recipe or a salt/pepper mixture. Place the chicken into the smoker breast side up and cook at 225-325°F until it reaches 165°F in the thickest part. 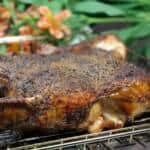 Some smokers will not cook beyond 225-240°F but you can get the chicken done faster and get a better bite through on the skin from higher temperatures if your smoker will do it. Let the chicken rest for about 10 minutes before carving and serving.